The nature trail Horní Blatná – Vlčí jámy (The Wolf Pits) is in fact a circuit starting and ending in Horní Blatná. The circuit measures almost 5 km and there are 7 signboards with Czech and German text placed along the path. The path begins in the square in Horní Blatná where you can park your car with no trouble. You can learn the basic information about Horní Blatná from the first signboard. From the square, the yellow-marked touristic trail will take you to a former mine Konrád. 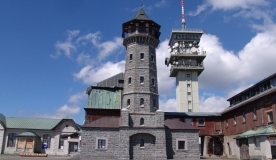 From there, you are very close to the technical monument Blatenský water ditch, and after that a quite demanding climbing up to the Blatenský vrch (Blatenský Hill) follows which you can make even longer by climbing another 85 stairs when getting to the top of the local lookout tower. From Blatenský vrch, you will go down to Ledová jáma (the Ice Pit) – 15m deep collapsed mine Jiří (George) which preserves ice all year long. From there, you will get to Vlčí jáma (the Wolf Pit) which was formed when one of the biggest mines in the area – the Mine Wolfgang – collapsed. In its deepest part, it reached the depth of almost 85 metres. Ledová jáma and Vlčí jáma form together the natural attraction called Vlčí jámy (The Wolf Pits). From the Nature trail Horní Blatná - Vlčí jámy, you can reach another interesting nature trail Blatenský příkop (Blatná Ditch).